I’m a sucker for beautiful books. It happens regularly that I buy books simply because they have a pretty cover—and I have discovered some really great books that way, books I would never have read otherwise (an example would be ‘The Gargoyle’ by Andrew Davidson). 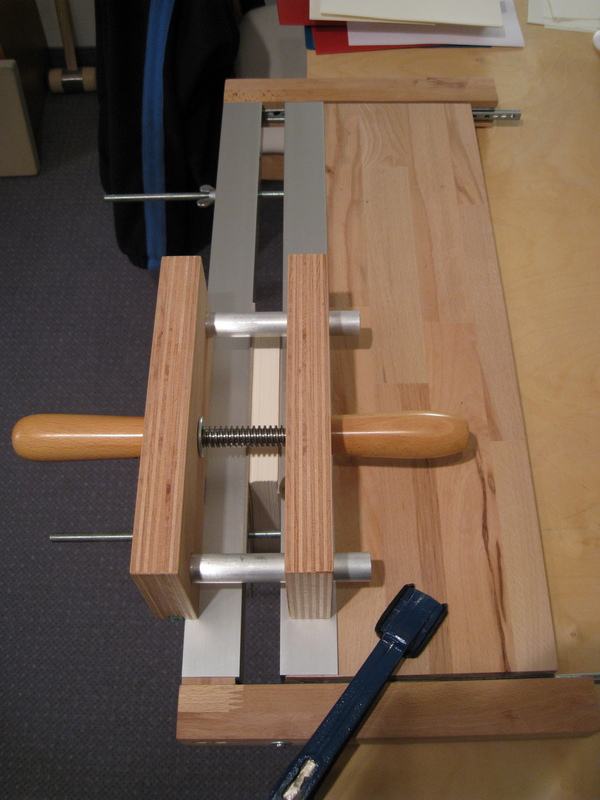 And about five years ago, I started to do traditional bookbinding as a hobby. I needed something to do in the evenings after a long day of staring at a computer screen, and I wanted it to be something where I can actually hold the result in my hands (unlike developing software where it happens quite often that the only indication that your program is working correctly is an entry in a plaintext log file). I had been in a workshop for traditional bookbinding a few years back, and I had absolutely loved it: The smell of paper and leather, the various tools, the skill and patience required, and the beautiful books that were the result. 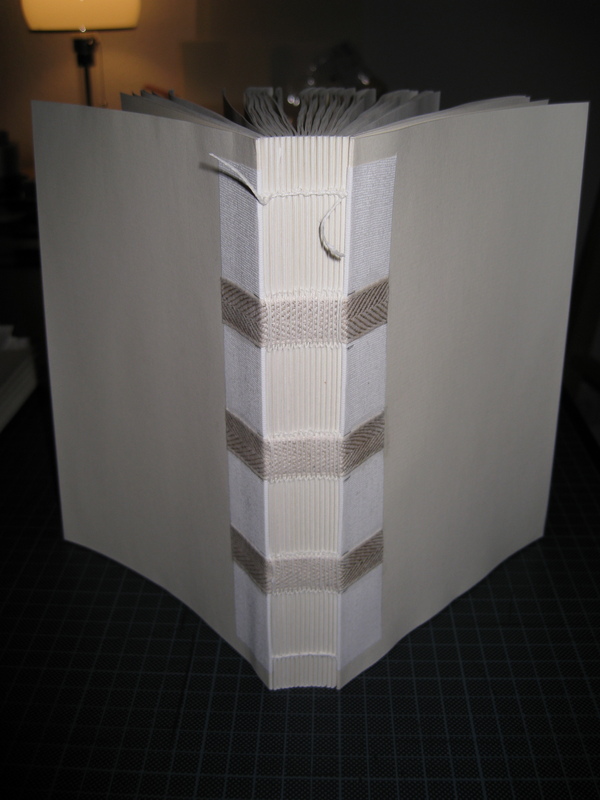 And so when I thought about what I could do as a hobby, bookbinding was the first thing that came to mind. 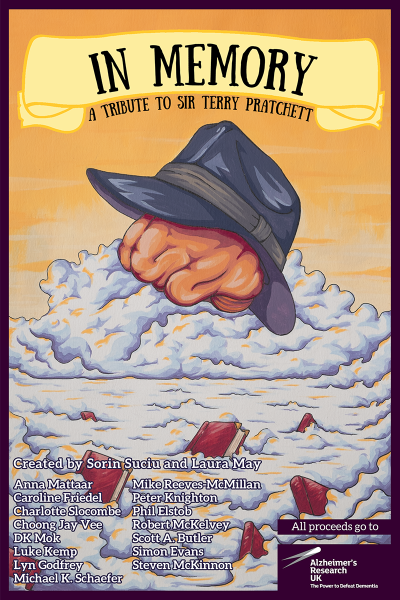 In Memory – A Tribute to Sir Terry Pratchett has a beautiful cover, I think we can all agree on that. 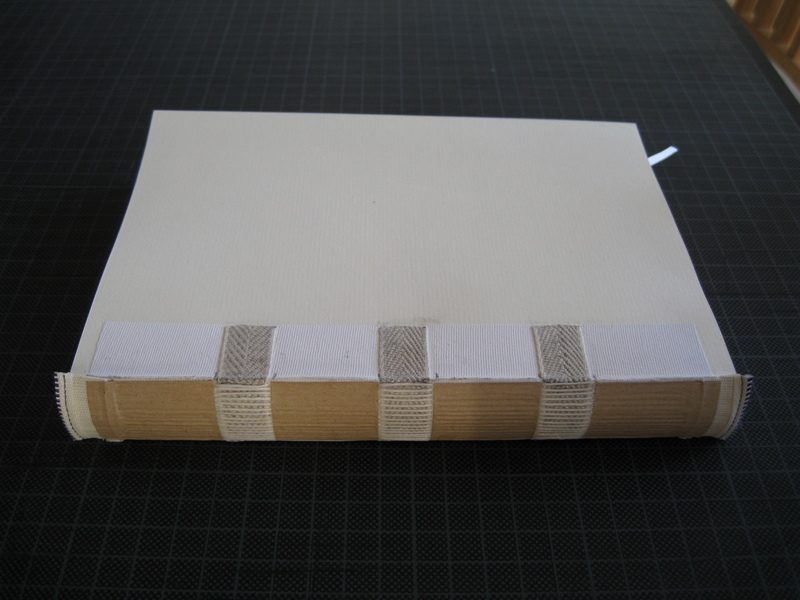 Nonetheless, I cannot resist the temptation to bind our book in a fine leather cover fitting for the occasion—and it was suggested that I document the process in this our blog and let all of you partake in it. I will do so in a series of posts, writing them as I go along. This is not supposed to be a step-by-step guide, but really just an overview over what I’m doing. Please feel free to ask questions in the comments section, and I’ll do my best to answer them. In this first post, I’m showing you how I create the ‘book block’, i.e. 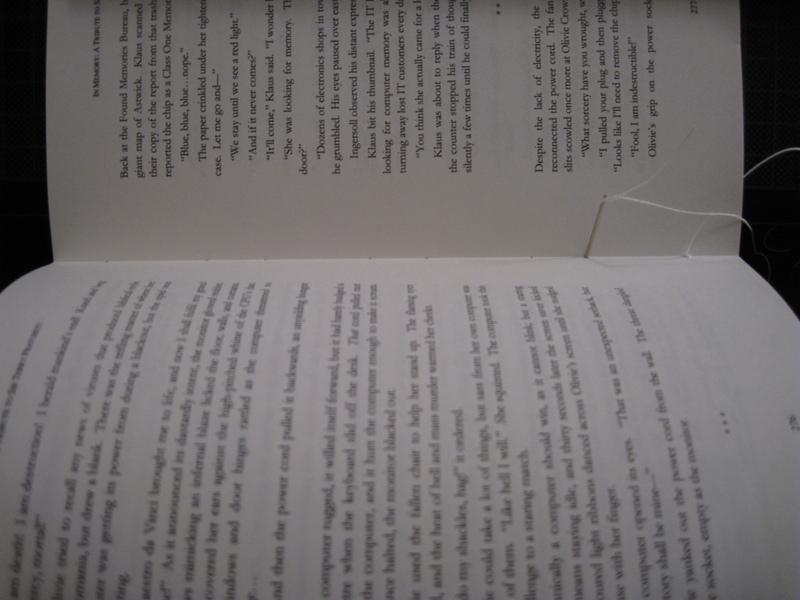 the core of a book that is comprised of the individual pages. The easiest way to do this is of course to simply remove the cover of an existing book and then create a new one for it. 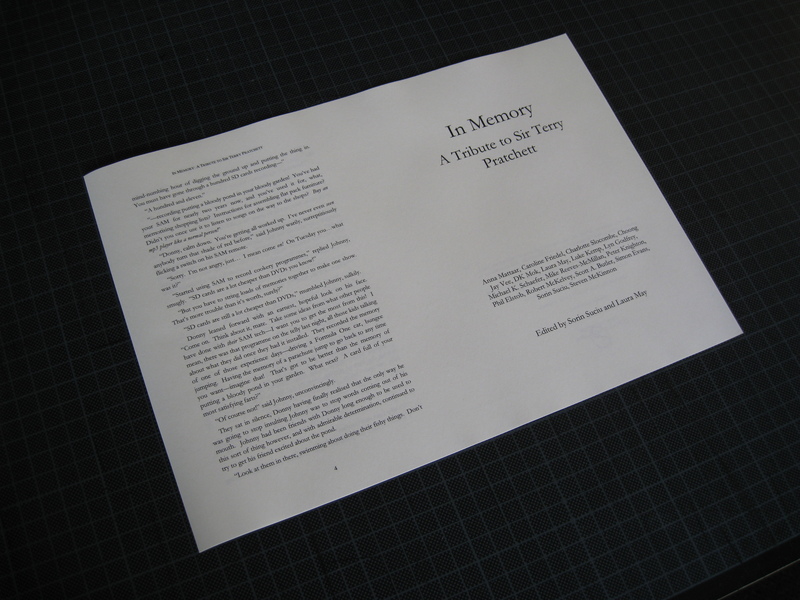 So for this project, I could remove the cover of a copy of In Memory (probably shedding a tear or two while doing so), and then create a leather cover for it. However, this wouldn’t make a lot of sense: Leather is an expensive material and requires a lot of work, and so I want to have a book block that is as durable as possible and justifies the effort that goes into the cover. 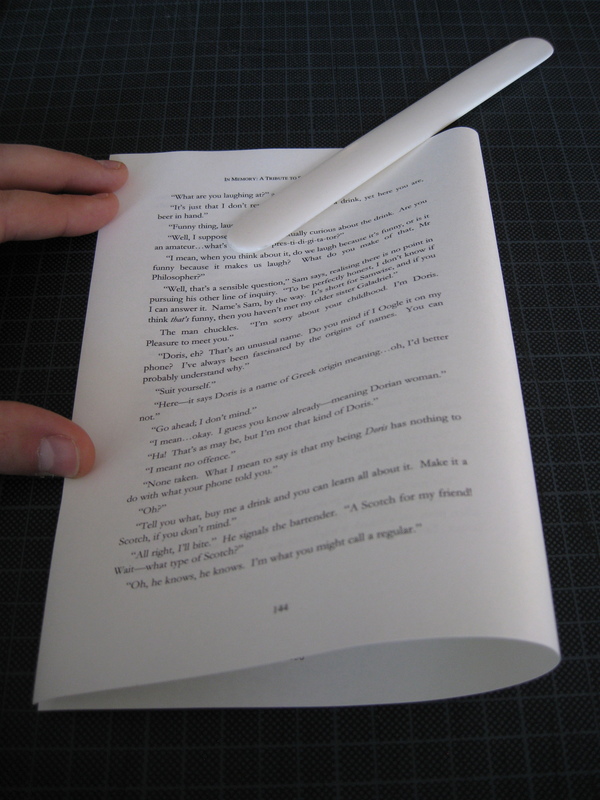 A normal paperback is simply a stack of pages held together by glue—this is fine in itself, but over time pages will come loose, especially if the book is read a lot and isn’t handled very gently. So what I will do is to print the book myself and then create a traditional hand-sewn book block (which will hopefully guarantee that the book still exists in a thousand years when aliens study the ruins of mankind and try to learn about our culture based on this genuine Old Earth artefact). By printing the book myself, I’m of course limited by the printer I have available at home. 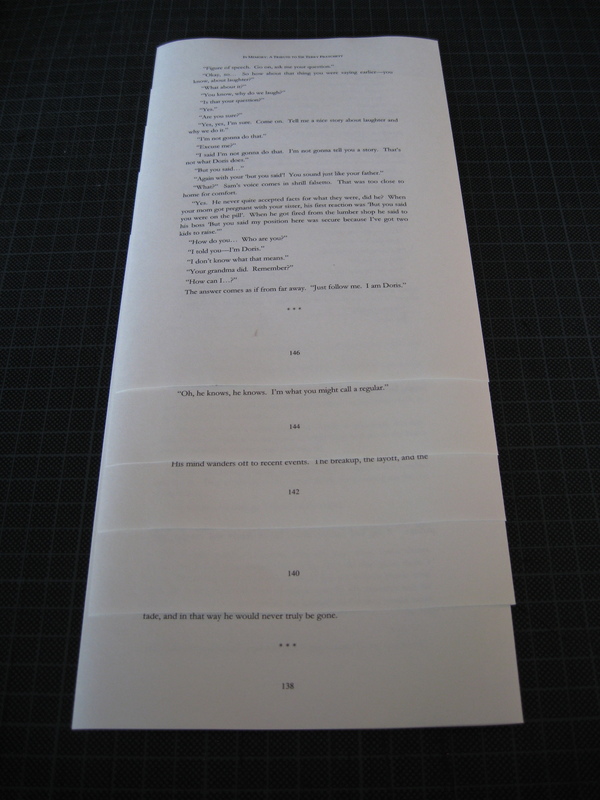 I have a standard A4 laser printer, which means that the books I can print on it can be no larger than A5. For anything larger than that, I need to have it printed in a print shop. But A5 is a good format for this project. I’m using a nice 90 g paper that isn’t completely white but instead slightly yellowish. 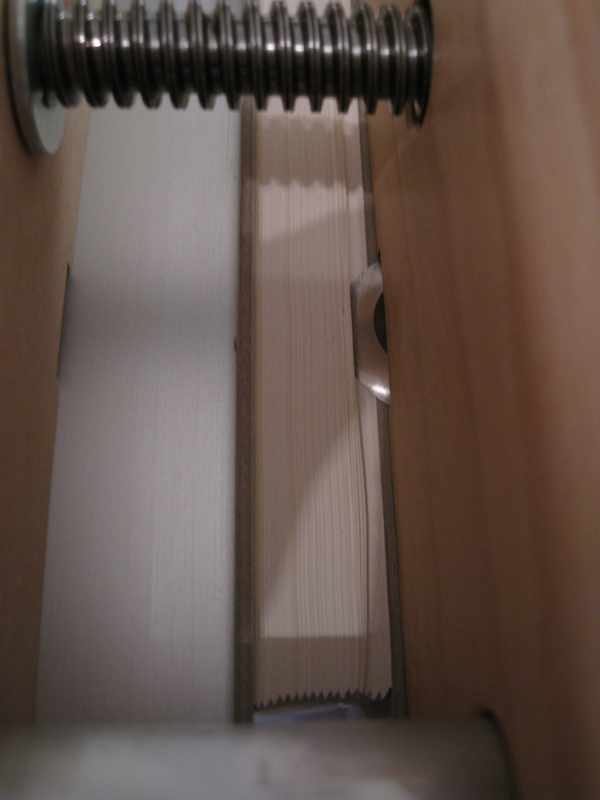 When using paper in bookbinding, you always need to check the grain direction: The fibres in paper that is produced by machines are aligned in one direction, and this defines how the paper behaves when it is exposed to moisture, e.g. glue. For the purpose of creating this book block, I need ‘short-grain’, i.e. the fibres need to be aligned parallel to the short side of the sheet. 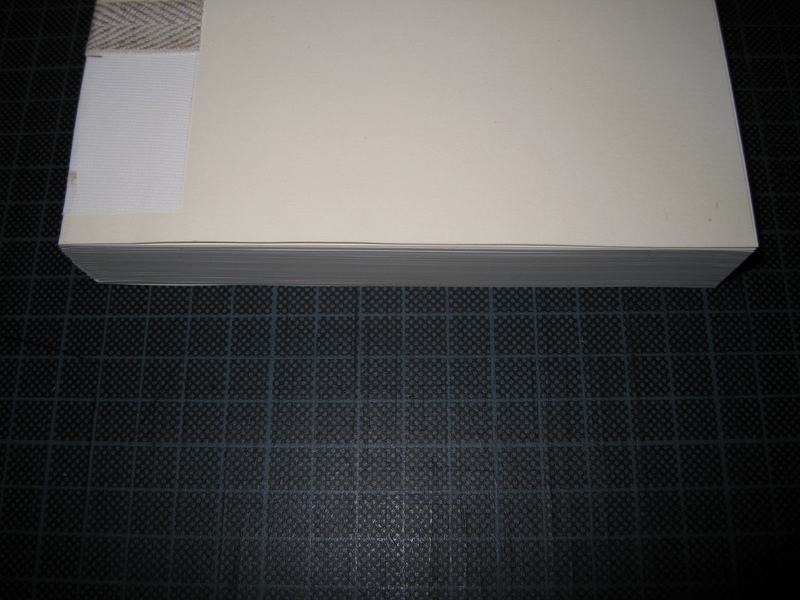 Most of the standard A4 paper you can buy is ‘long-grain’ (fibres aligned parallel to the long side of the sheet) and is therefore not suitable for bookbinding. Luckily, there are specialised shops on the internet where you can buy the good stuff. The first empty page is replaced with one that has my logo on it (yes, it’s silly, but it’s my project so I’m allowed to do that). 10 empty pages are added at the end. A page with the year the book was bound is added at the end. Why the empty pages? 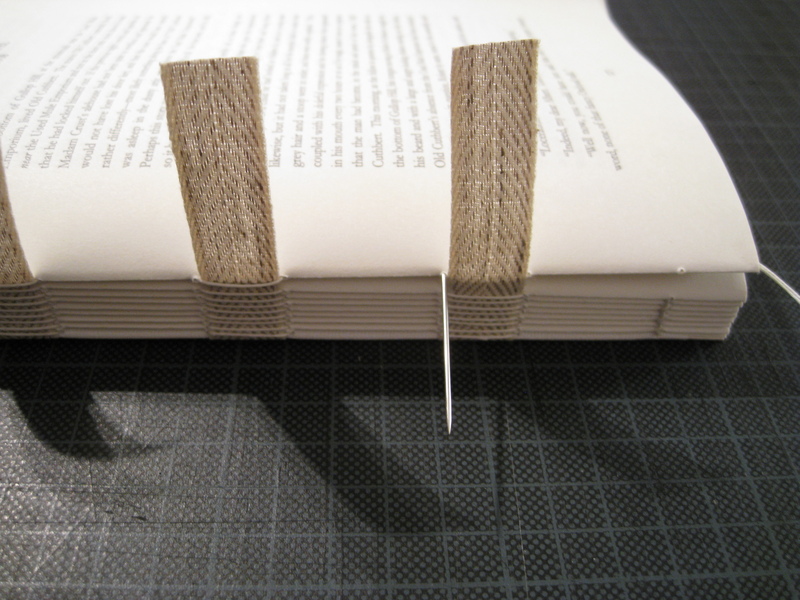 Well, a sewn book block consists of a number of booklets—known as ‘signatures’—that are sewn together at the back. In this case, I decided that each signature will consist of five A4 pages, so that each signature will hold 20 book pages. The master document of In Memory consists of 309 pages, and with the one page replaced and 11 new ones added at the end, we get an overall number of 320 pages, which is 16 signatures. If I wouldn’t add pages, then I would get one signature at the end with a different size, and that wouldn’t look good. The pages of this extended document now need to be resorted so that five sheets make up a booklet with the pages in the right order. For example, here is a page from the first signature, showing the master document’s pages 18 and 3. 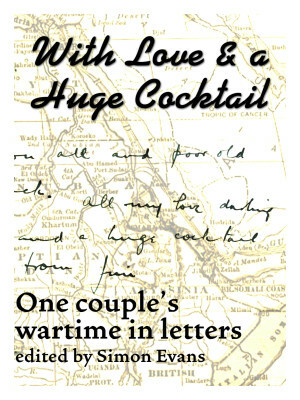 This looks weird but in the finished signature the pages will be in the right place. Fortunately, there is software that allows you to create booklets and that handles the resorting for you. In order to create the signatures, the single sheets need to be folded. Usually, this is done using a bonefolder. Yes, it’s really made from bone. 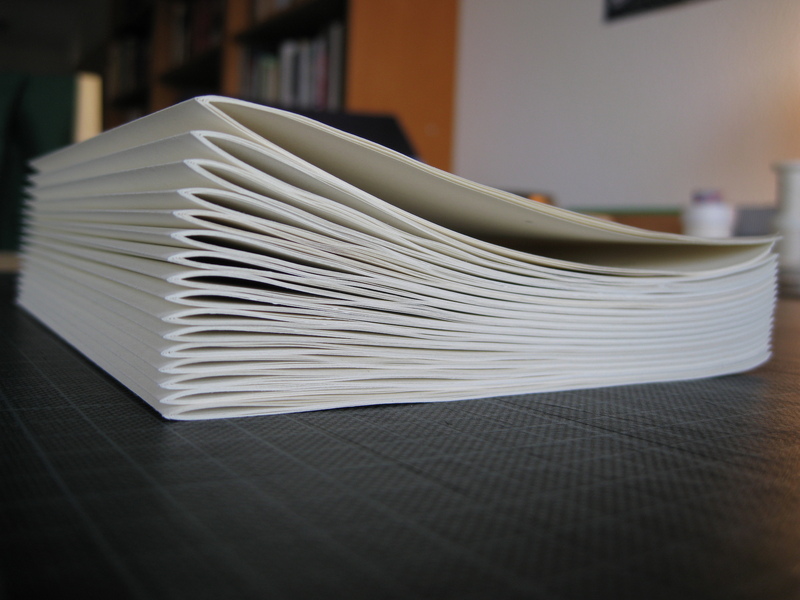 Bookbinding is badass. 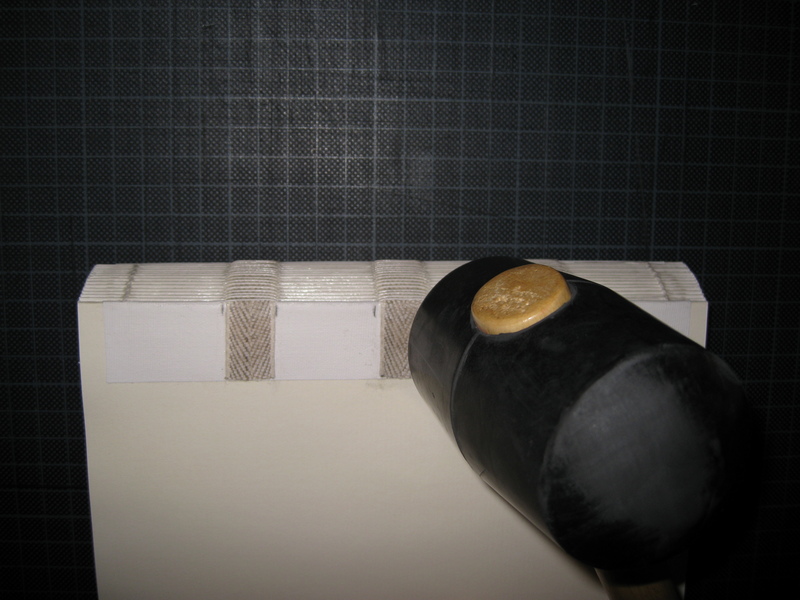 On the first and the last signature, an ‘end-paper’ is glued and the hinge reinforced. I’m using a classic plain end-paper for this project. 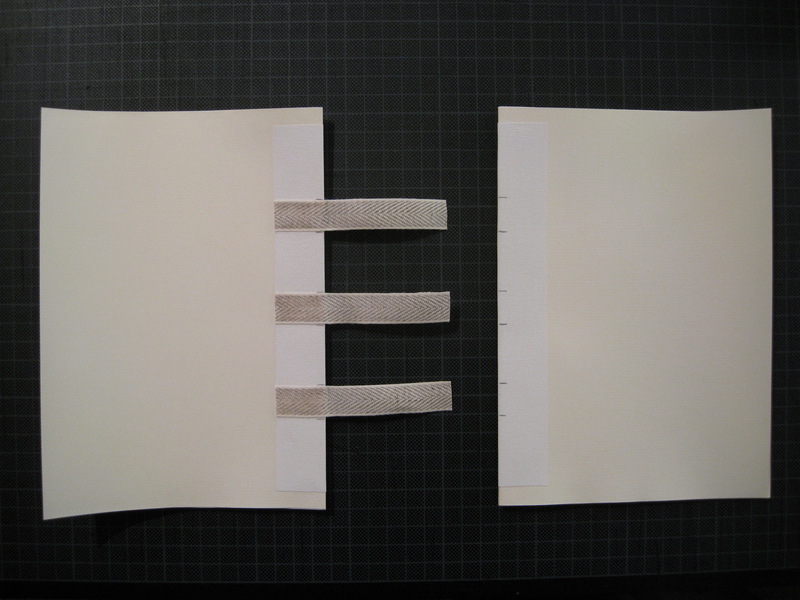 In addition, sewing bands are attached on one end-paper, which are needed in the next step. The individual signatures are now sewn together with linen thread. Once all signatures are sewn, the sewing bands are fastened on the opposite end-paper. Now we have a book block, but its edges are uneven. 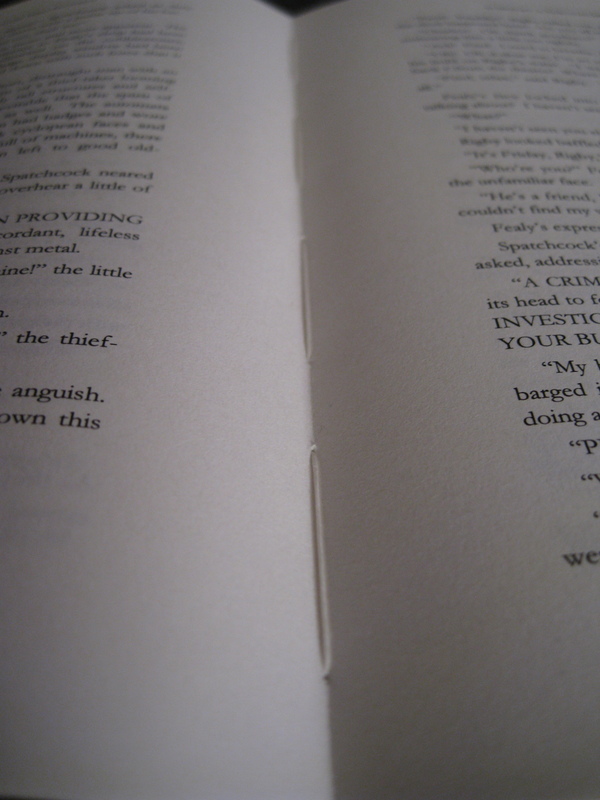 While you will see books with untrimmed edges from time to time (they give the book a vintage/antique look), most books have even edges. And that’s what I want for this project. 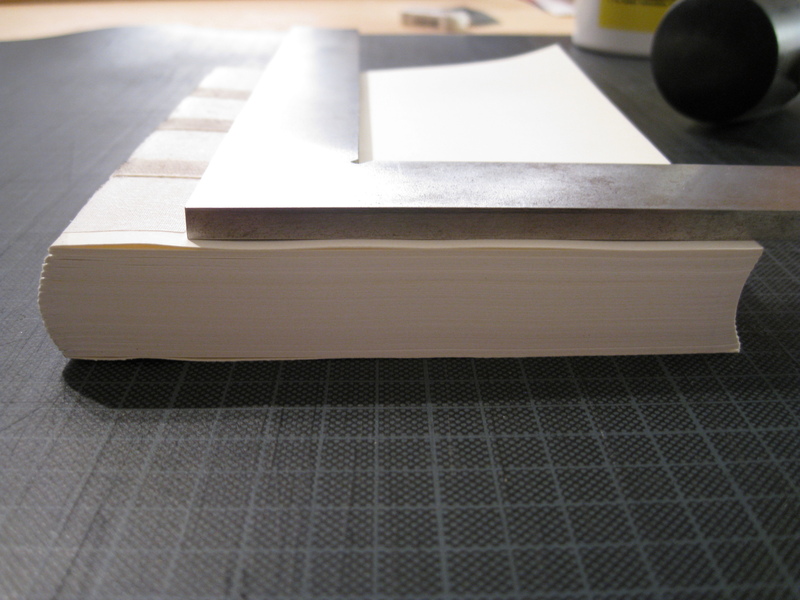 To trim the edges of the book block, I’m using a trimming plough. 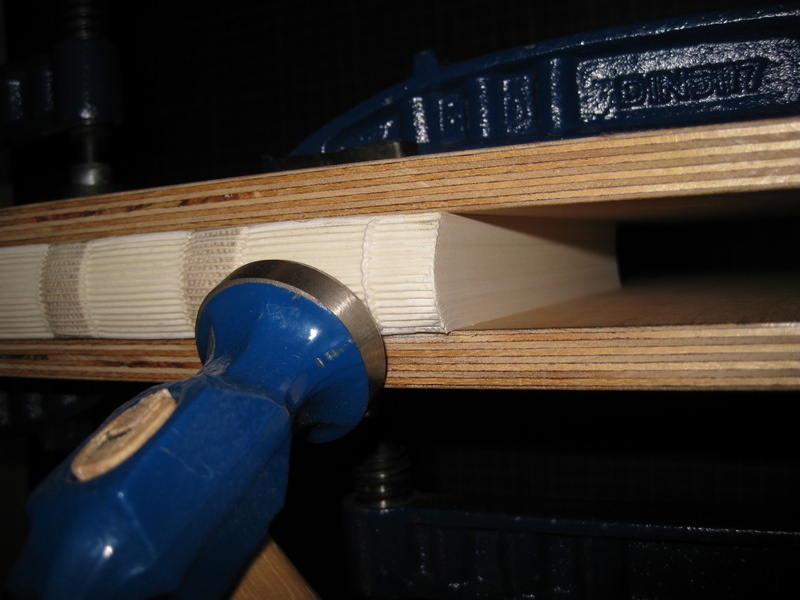 The book is firmly clamped in a press, the plough is moved back and forth and gradually tightened, and its round blade cuts the pages of the book block. The classic book has a rounded spine. This is not only done because it looks nice, but also because it increases the stability of the spine and reduces the swelling caused by the sewing thread. 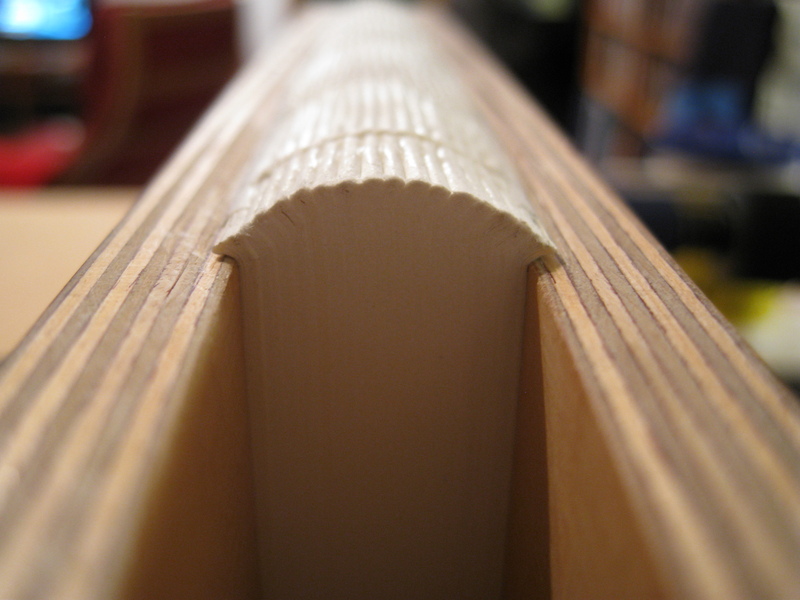 At this stage, the spine has already been glued. Rounding the book block is an intricate procedure that requires precision tools and highly advanced skill acquired in years of training: basically, you give it a good whack with a hammer. The spine in then shaped further to create ‘shoulders’ on both sides. This helps to preserve the rotundity of the spine over time and use, and the shoulders function as the points around which the covers will swing. Again, this is done by gently hammering the spine. But using a different hammer. The book block is almost done, only two things are missing. 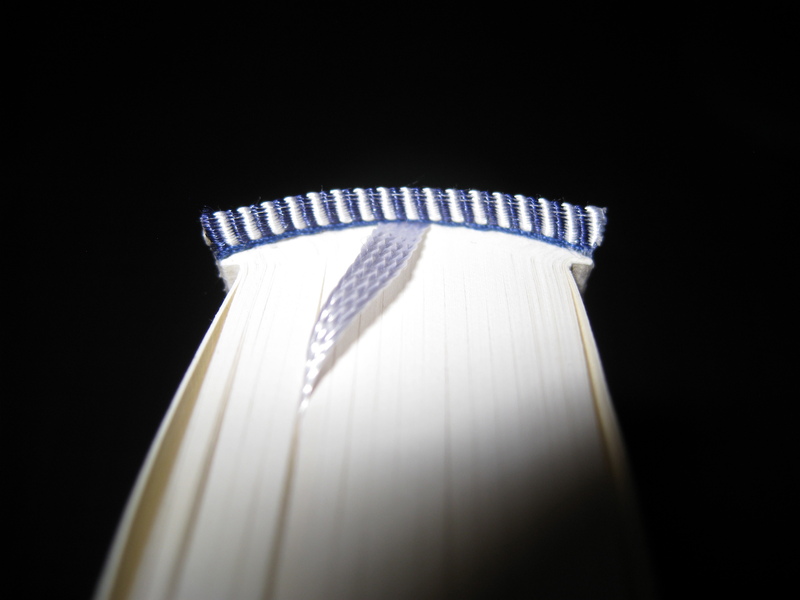 First, I’m attaching a ribbon as a bookmark, as well as headbands at the head and tail of the book. Headbands also have a protective function, but mostly they are simply decorative. And second, I’m glueing strong paper onto the spine for additional stability. And that’s it. The book block is ready. In the next post, I will show you how I create the leather cover. This was very informative and fun to read! Can’t wait for the next post! Wow, Michael – that was incredibly interesting! Can’t wait to read what happens next. Kudos to you, my friend! Such a fascinating and painstaking process. I can see why you love it so much.